I made this smoothie so I could enjoy a quick and nutritious breakfast after my morning walk. I call it my AC/DC smoothie because it was bright and sassy, a perfect drink for a sunny day. You can almost hear T.N.T. playing in the background. This combination isn’t my typical go-to and I’m so glad I just threw it together because it turned out so good. It’s a beautiful creamy orange color and boasts 7 grams of fiber and 3 grams of protein within a less than 200 calorie frame. The banana, grapefruit and carrot can all be detected subtly but they balance each other out, just right. 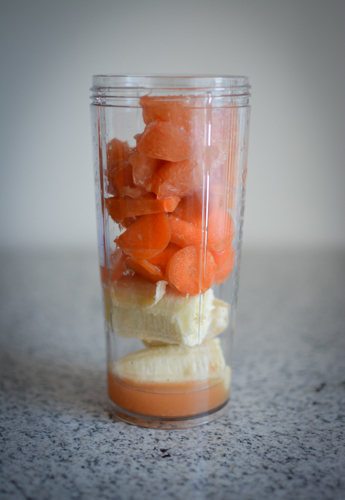 Add to a tall personal blender cup, add water (leaving an inch of space) and blend until smooth. Now for this week’s 10 things! I came down with a head cold on Tuesday. Boo! It’s my first time with a cold in over a year and without the practice you’d think I was on my deathbed. I felt awful but am feeling much better after the first 3 days. I tried to distract myself from morbid thoughts by catching up on season 8 of Supernatural. Love. That. Show. Jeremy can make a KILLER green smoothie. I have to let him in the kitchen more. I bought some books on food styling, so I’ve started pouring over those. Went on my first walk in several days, yesterday. It felt good to get everything stretching and moving. No atrophy! We also went to the WSU Tukey orchard and bought red delicious and opalescent apples along with cider and potatoes. Best apples ever! Getting your period while being sick, is pretty much the worst. I love every single bit of nature here in Pullman, there is always a new tree or animal to admire. It makes my heart happy. I put some coconut oil on my tresses for an overnight treatment and forgot how much I love the feeling after a shampoo the next morning.